Our qualia pavilion is tucked away at the end of one of those mysterious paths, suspended among the trees, above a quiet pebbly beach. You can hear the sea sucking at the stones. 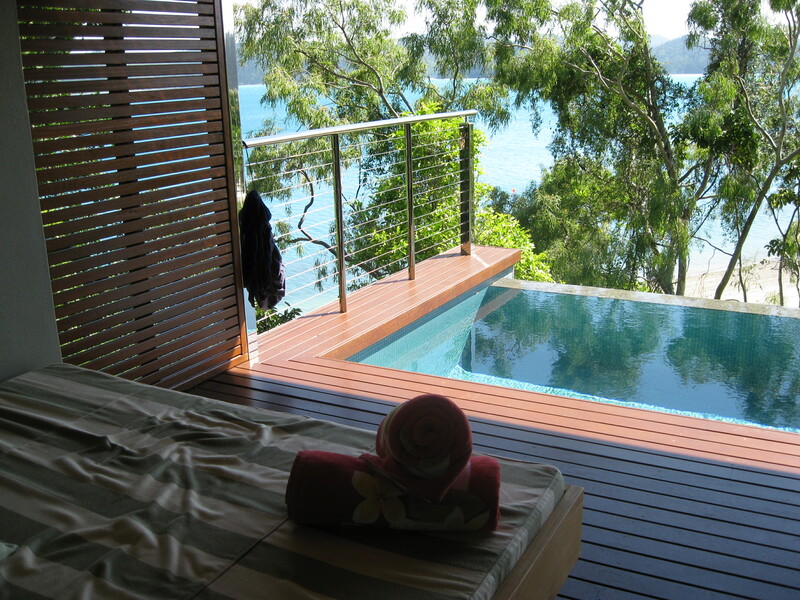 Qualia pavilions are simple, spacious and like the Long Pavilion, in perfect harmony with the world outside. Its colours are the colours of wood, stone, earth, forests and sky from the Dennis Nona artworks on the walls to the fabrics selected by interior designer Freedman Rembel for the furnishings. Every space leads to another, each room flows to the next. On one side the living room opens onto a wooden deck with an infinity pool and a king-sized cane bed, on the other is the bedroom with a giant central bed. Beyond the bedroom is an enormous bathroom dominated by a tub of warm cream stone. Every room looks down, through the front glass wall, on trees, gardens and the sea. There 60 pavilions at qualia but each one is hidden in its own corner of the 33 hectare garden. We feel that we have the island all to ourselves. Fans tick slowly overhead. I press a button and a glass wall rolls down. A gentle breeze blows in through the open space, bringing the smell of the sea and eucalyptus trees. There’s a flutter of wings and a sulphur-crested cockatoo lands on the rail of the deck. I am indeed in the Garden of Eden. It would be easy to stay here forever, living on the complementary champagne, the Phillppa’s fine bagel crisps and garlic nuts, the mini-bar chocolates, the pretty little packs of herbal tea, luxuriating in the Aesops toiletries, the cloud-like towels, and the soft cocoon-like bathrobes, drinking in the views from the infinity pool, the king sized bed and the wrap around couches in the lounge or even ordering in from the sumptuous room service menu. But another zephyr ushers a faint hint of grilled seafood with a tang of je ne sais quoi through the open window. I am reminded that “the qualia experience would not be complete without a culinary adventure through the finest produce our region and country has to offer”.